So after making various turns in the market’s nooks and crannies, Natasha came across various cute jewelry shops. Putting her ‘I-know-what-I’m-doing-when-it-comes-to-bargain-hunting’ look on her face, it only took a second until a friendly shopkeeper approached her to convince her to buy the necklace, because it’s cheap cheap and nice. And please, do not, we repeat, do NOT, ask Carmen and Natasha to try to remember where these stalls were located, because finding the exit was an art in itself! Below are some of the cute finds found at Chatuchak Market. 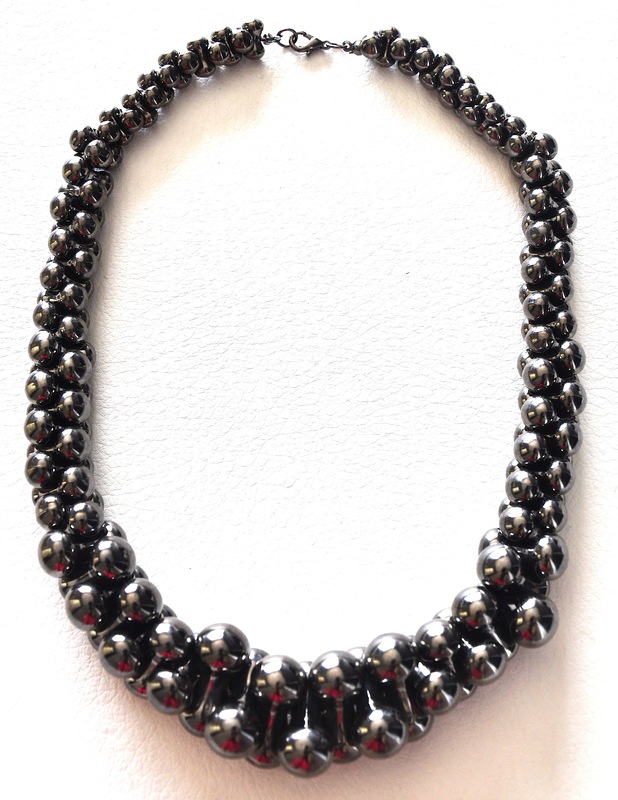 The necklace above has many tiny bells attached to it, so if you plan to sneak up and scare someone, don’t even think about it because he or she will be able to hear you from a mile away. This one costs a mere SGD30! This one is Natasha’s favorite! 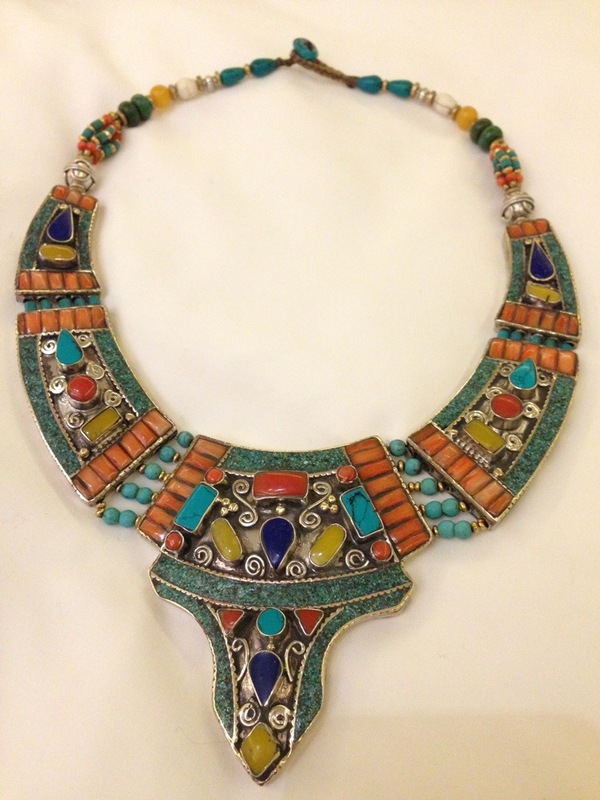 Remember our previous post on Egyptian jewelry at the Met? 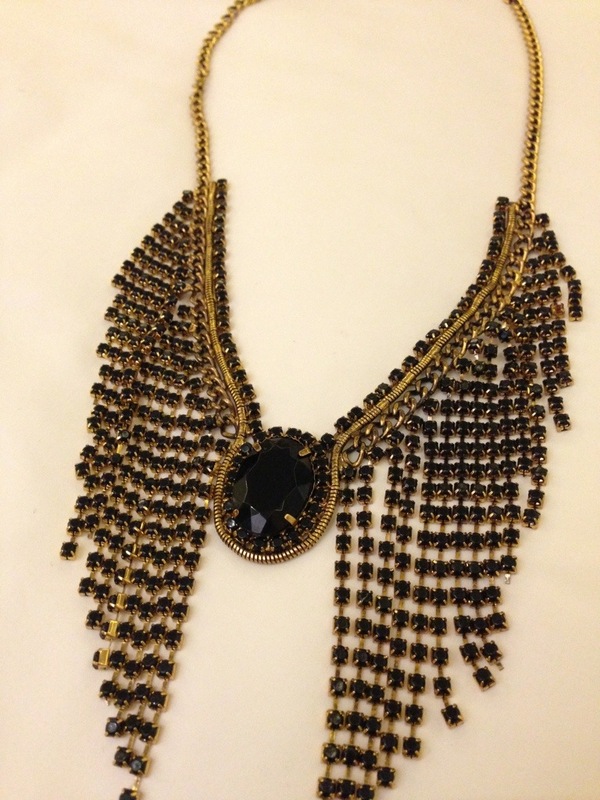 Well, this necklace reminds her of one of the pieces. The colors, the design – divine! It’s actually from Afghanistan and costs SGD60. 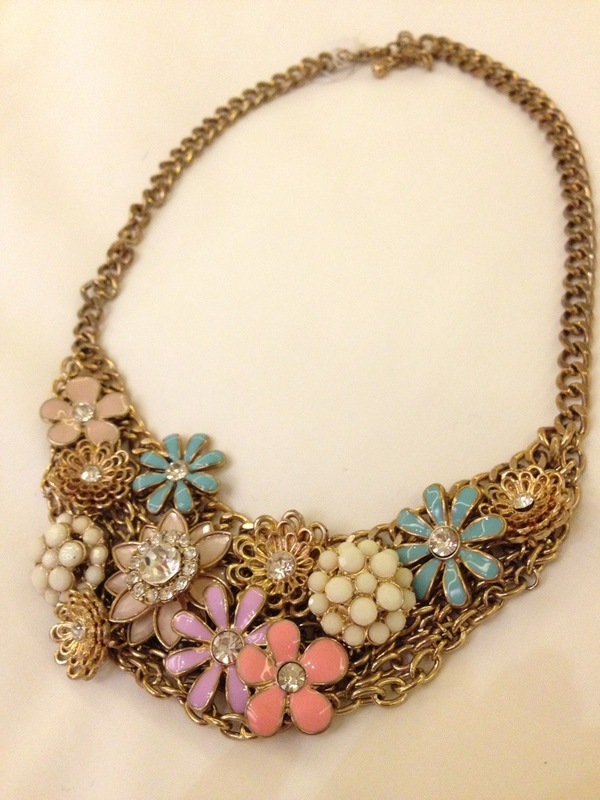 This pastel flower necklace is Natasha’s second favorite. It’s so pretty and made in Korea. not bad for SGD40. 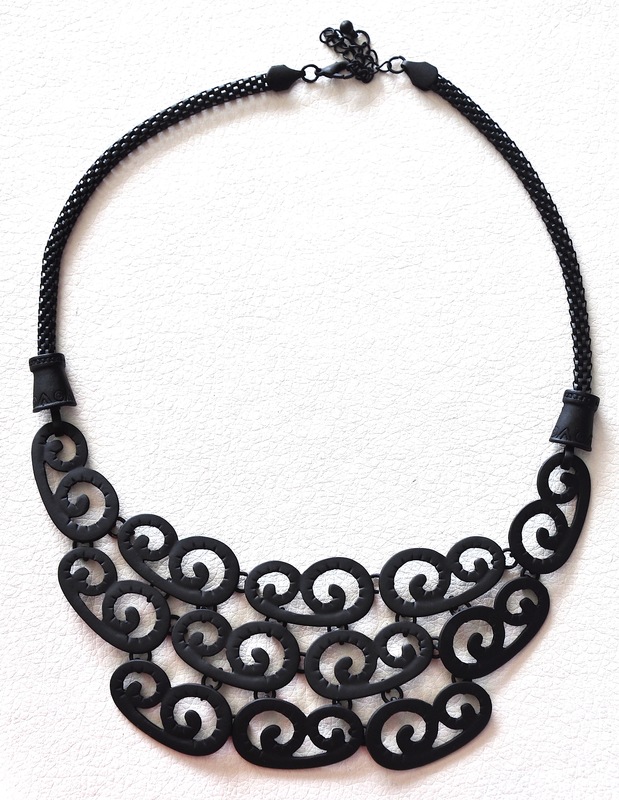 The black necklace looks awesome on. Half convinced when it was hung, Natasha decided to give this necklace a chance and tried it on. And boy, did it look amazing! A bit steep at SGD65, but heck – if you have a strong urge to buy it then just bloody buy it! Oh, that’s another tip for Chatuchak shoppers, if you see something you like, just buy it because chances are you will never find the shop again. Watch out for more Bangkok write-ups – we love this city loads! 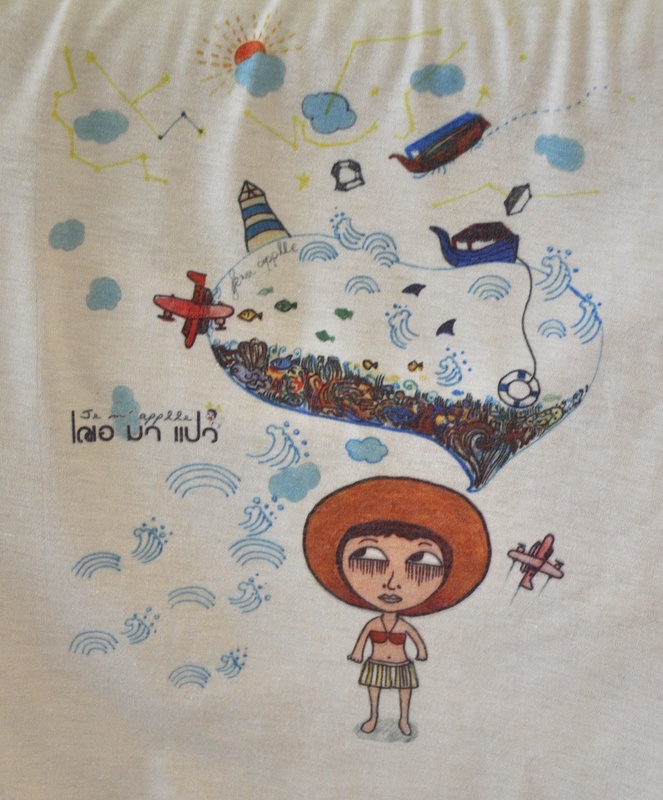 Bangkok shopping part 3 – the clothes! Ok so Carmen did go a little crazy in Bangkok. Here are some of the clothes she bought, and details of where to find them! Blue pleated silk top from Union Mall. Cost: SGD10. Available in all different colours and we love that you can either wear with a belt or tuck into a skirt! Either way looks chic! This printed tank below was bought at Chatuchak market from a store in Section 3 called “Masque & 17:09”. If you can’t handle the heat of Chatuchak, then note Carmen also spotted the same store in the air-condiioned Terminal 21 store. Price was SGD10 at the market. Ok Carmen is a bit obsessed with the bird skirt below. After falling in love with the Nana and Bird skirt tried on in an earlier post (see here) – Carmen saw this cheap version and had to buy it! Bought at a shop on the first floor of Union Mall (if you are entering the mall from the train station, the shop is further down on the left). Price of skirt: SGD20. The top was also bought in Bangkok, and is actually the white version of the blue top with pink buttons above. The buttons at the back are white however, and we love it! Top priced at SGD10. Ok this is Carmen’s favourite piece… The red skirt! The quality is really high, and amazingly it is made using just one piece of fabric – so there are no seams all around the skirt! Found in Section 3 of Chatuchak market. They also had this skirt available in black and grey (yes…. Carmen bought all 3…!). Priced at SGD35, this was one of the most “expensive” items bought in Bangkok, however the quality was the highest seen during the whole trip! And yes, no shoes in the shoot. Sometimes it’s just nice to walk around barefoot, this skirt certainly makes you feel more playful! 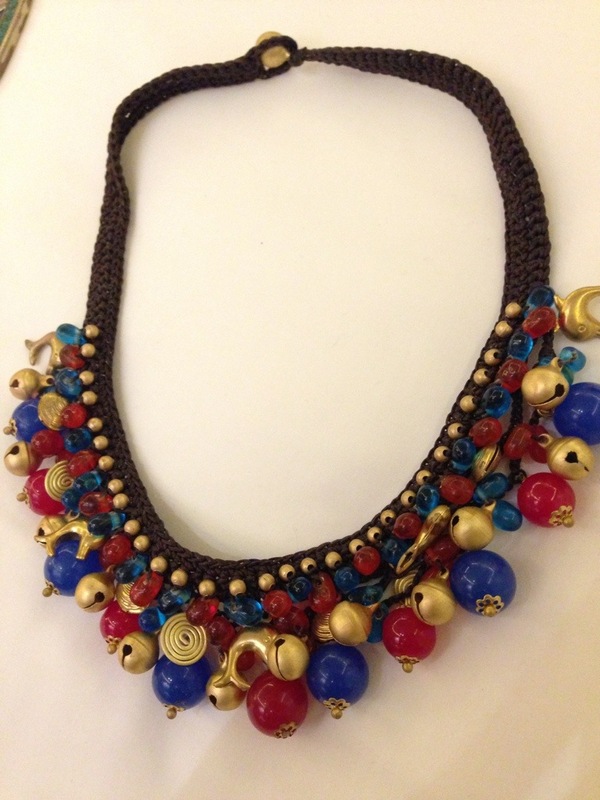 Shopping in Bangkok: Part 2 – Accessories! 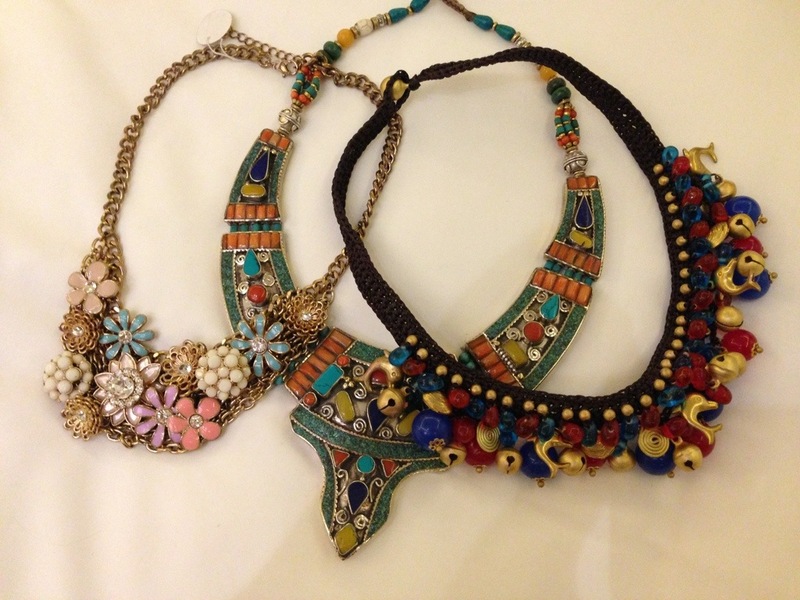 Here are the accessories that Carmen picked up whilst in Bangkok.They pretty much all cost 10 SGD each. All of these were bought at Chatuchak market (go to section 3, it is by far the best part of the market and the only section worth going to for fashion and accessories!). 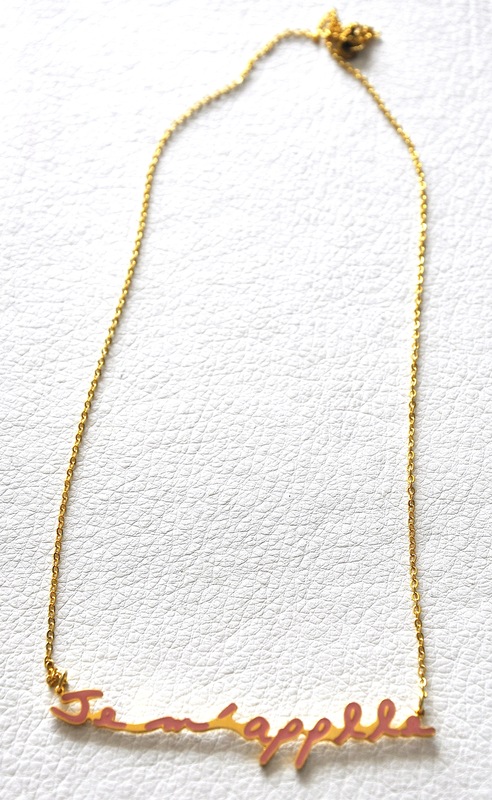 Ok so we think the necklace below was meant to say J’mapelle but in classic Asian form it is spelt Jem’applle…. But we like it anyway!!! 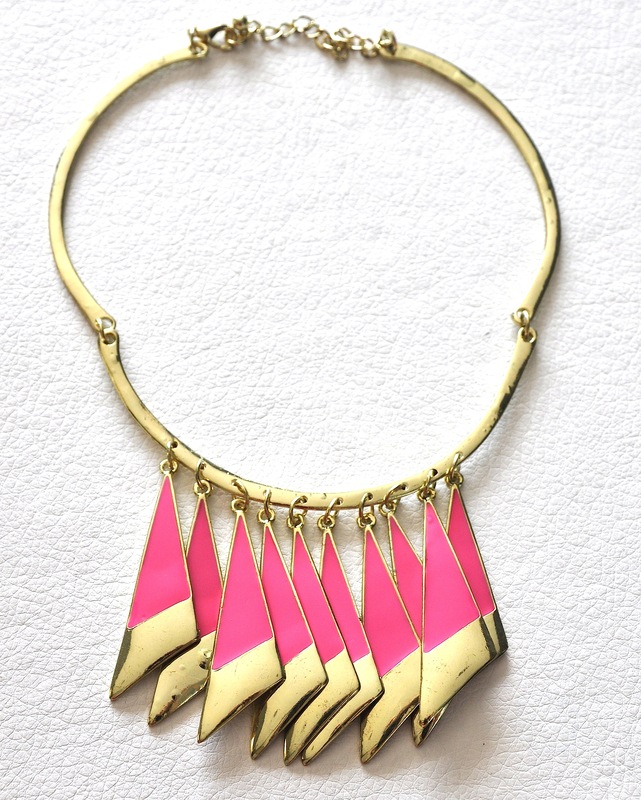 And its a super cute necklace to wear over a casual tee! Still to come…. clothes purchased in Bangkok! Shopping in Bangkok! Part 1 – The Shops! Yes Carmen and Natasha are going international!! Well ok, a 2.5 hour plane ride to Bangkok, but still we thought our readers would appreciate the gesture. So here are some of the best shops and stores that we absolutely adore in Bangkok baby! An upmarket shopping mall in Bangkok, think Paragon in Singapore but ten times better! Why? Well just look at the pictures below – the mall is stunning! We adore this store display below, not to mention the clothes. This is the storefront for JASPAL – a brand started in Thailand and offers high fashion ready to wear pieces at affordable prices. We highly recommend a visit, even if it is just to stare at their gorgeous displays! Ok so Siam Center itself is closed for renovations until December this year, but they have pop up stores mainly between Siam Discovery mall and Siam Paragon – check out how creative the store displays are below! 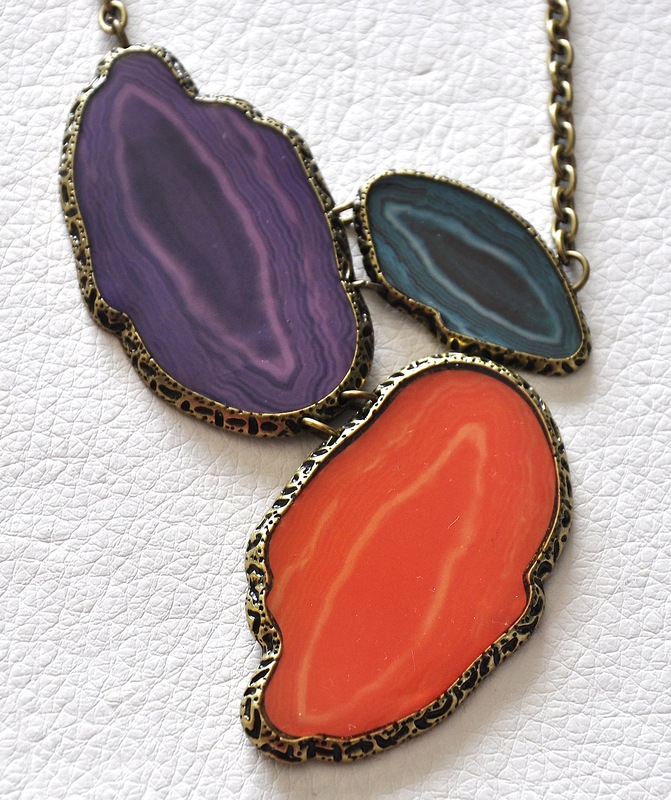 Check out this die necklace below – super cute! Available at the Siam Centre pop up store in Siam Paragon. Opposite the Siam Center, you can check out Siam Square, which has loads of little individual shops on street lanes. These aren’t as cheap as the markets, but you can still find some gems here, and they are reasonably priced for independent designer prices (you’re looking at 1000THB and upwards mostly. which is 40SGD and up). Again, the headwear is not advisable below, but we do love the decor and who doesn’t love a bit of houndstooth?! This mall is a haven for younger designers and we love the quirky space at the top of the mall where the movies are – very artsy! This mall is where you will find loads of university students snapping up clothes and accessories! One level in Union Mall is entirely devoted to young designers! We love that! It’s always fun to support local talent and browse through their unique designs! Woah this market is not only the biggest outdoor market in the world, it is also the HOTTEST. And we mean H.O.T. There are loads of people around and it’s easy to get lost. We recommend sticking to section 3, which is where all the young, funky designers are (there is a huge difference between this section and the other sections in the market, in our humble opinion), and then finish the day with a foot massage (you’ll need one) and a cold shower! Below was one of the awesome shops in section 3 of the market – but note we found out later that a lot of these stores also have outlets in air-conditioned malls as well! So if you can’t handle sweating buckets at this outdoor market then just head to Terminal 21 Mall and Union Mall instead! One of the coolest malls ever, also one of the tackiest but it is done so well that you can’t help but smile at the concept! Terminal 21 is based on arriving at an airport, where the information staff are even dressed as airline crew! Each floor is dedicated to a different country/city, so you have Greece, Paris, London, Tokyo and San Fran all in the one mall. There are also a lot of different stores here so it is worthwhile stopping by! Seriously, a double decker London bus in the middle of a mall in Bangkok! What next?! When eating ramen or sushi just doesn’t give you enough of a Japanese fix, head to the Tokyo level! They even have massive sumo wrestler statues! LOVE this shirt below! Perfect for the office. We also rate Platinum Mall if you are looking for wholesale bargains (but note, this is for the die hard shopper, not for the delicate!). In part 2 of Bangkok, we will show you what Carmen purchased! Like Survive Asia on facebook! Scarlet & Ebony: Up to 90% off shoes sale in Singapore!